2nd International Conference on Social Sciences, Humanities and Technology (ICSHT, 2018) are organize by Global Academic Excellence (GAE). 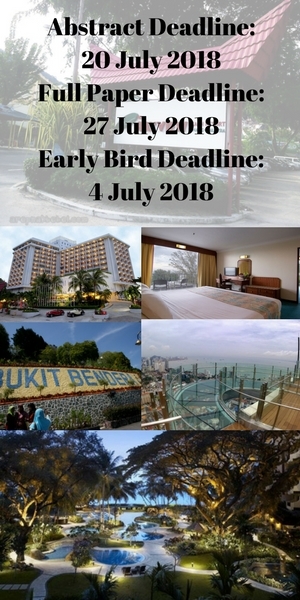 2nd ICSHT 2018 will be held on 4th (Saturday) to 5th (Sunday) August 2018 at Bayview Beach Resort, Batu Ferringhi, Penang, Malaysia. Last year 1st ICSHT was held at Hotel Perdana, Kota Bharu on 2nd and 3rd December. The aims of this conference is to provide a platform for the intellectuals from various fields and disciplines in Social Sciences, Humanities and Technology to debate and discuss the current issues worldwide as well as finding solutions to the problems, besides offering them to exchange and share their knowledge and experiences with others. In addition, this conference also provide collaborative environment for academicians, researchers and practitioners to present their idea, research progressing and research results on various theme and subtheme as per list on the above button (theme) of this website. Therefore, the organizer of this conference would like to invite with honored the prospective authors to submit their original manuscripts to ICSHT 2018. For selected paper will be publish in ERA journal with additional fees.